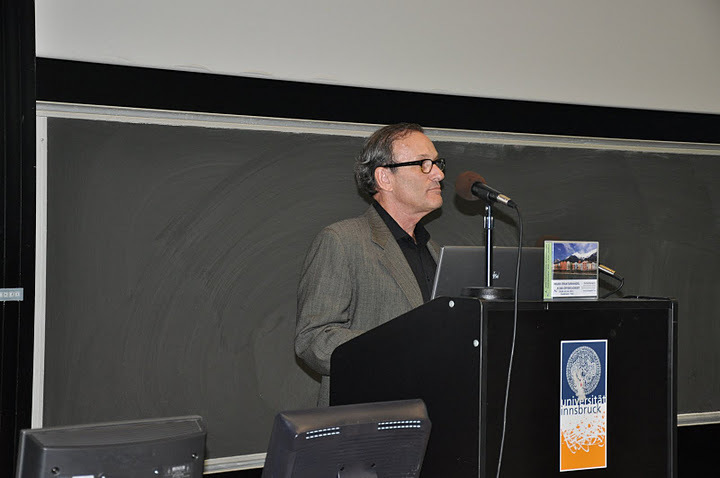 From 29 September to 1 October 2011 the third joint conference of the German Sociological Association, the Austrian Sociological Association and the Swiss Sociological Association took place at Leopold-Franzens University in Innsbruck (Austria). Along with 700 other participants I made a trip to the beautiful capital of Tyrol and was rewarded with thought-provoking presentations, stimulating discussions as well as enjoying some of the cultural and culinary pleasures of Innsbuck. The extraordinarily well-organised conference stood under the theme “The New Structural Transformation of the Public Sphere”. In four plenary sessions (Plenary 1: Boundaries and the end of boundaries to the political public sphere; Plenary 2: Legitimation and the legitimacy deficits of the social order, Plenary 3: Media logics and political communication; Plenary 4: Regulation without a public) and close to fifty panels, including ones on Intellectuals, Privacy, Media, Networks, Gender and many more, scholars from around the world discussed the changed (and changing) role of the political public sphere in our times of globalisation, digitalisation and commercialisation of the media. 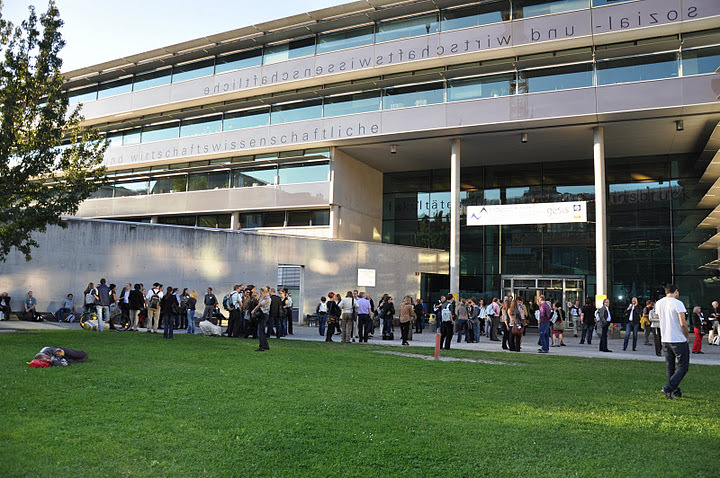 The modern campus of Innsbruck University’s School of Political Science and Sociology, located in the centre of Innsbruck, was the host of the three day conference. 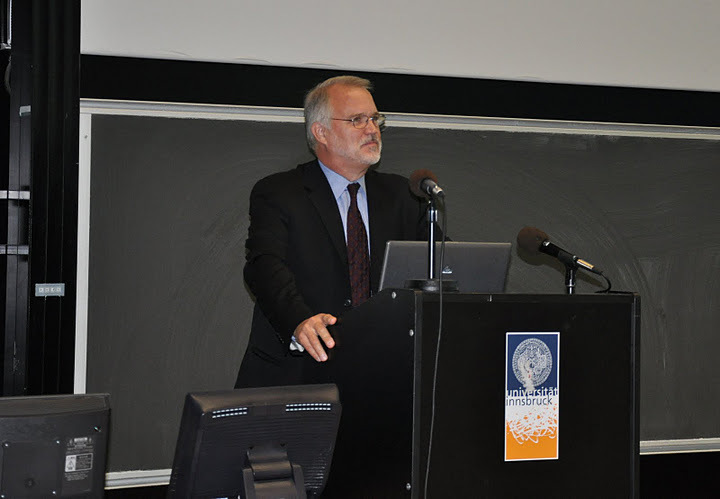 The conference kicked off with a stimulating keynote performance by Craig Calhoun who spoke on “The Public Sphere”. He raised questions such as “why and to what extent do we think of the public as spherical?” and “does the public sphere imply the synthesis of one unified consensual mass opinion or should we rather be talking about multiple contradicting public spheres which exist in order to challenge the dominant public?”. Calhoun suggested that the multiplicity of social movements and resistance groups such as those we saw speaking out publically most recently in the context of the Arab Spring, implies that it is the latter form of public spheres – those that problematise the dominant consensus – that we are confronted with today. He added the question of whether this then represents a decline or corruption of the public sphere or simply something that has been part of civil society all along. Calhoun further probed the legitimacy of being able still to consider academia as the ideal public sphere that Habermas made it out to be in light of the inequalities within the academic community related to its infrastructure, issues of funding and language. He called upon sociology as a discipline to “put things that matter on the agenda”, suggesting that an inherent fault of the discipline is its tendency to undermine itself by reproducing problems rather than thinking about new issues in new ways. Ultimately, Calhoun invoked the importance of seeing the public sphere not just as a realm for rational-critical debate but as a culture-forming activity; a way of making history, not simply communication. Three days of sunshine and unusually warm temperatures for the beginning of autumn made it an even greater pleasure to take advantage of the accompanying social program. The Friday-night conference dinner was a particular highlight. We were taken up by a cable railway to 1905m to the Restaurant Seegrube to enjoy traditional Tyrolean delicacies with a stunning view over the mountain range and valleys. View from the top of the cable car where we enjoyed a fantastic conference dinner. 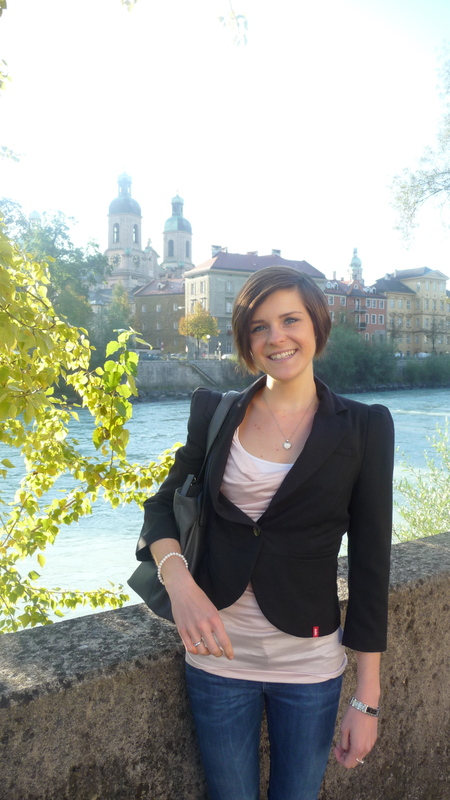 When my brain needed a break the sunny weather enticed me to explore the charms of Innsbruck. Panoramic views, culture and history abound in this little city with a population of ca. 130000. 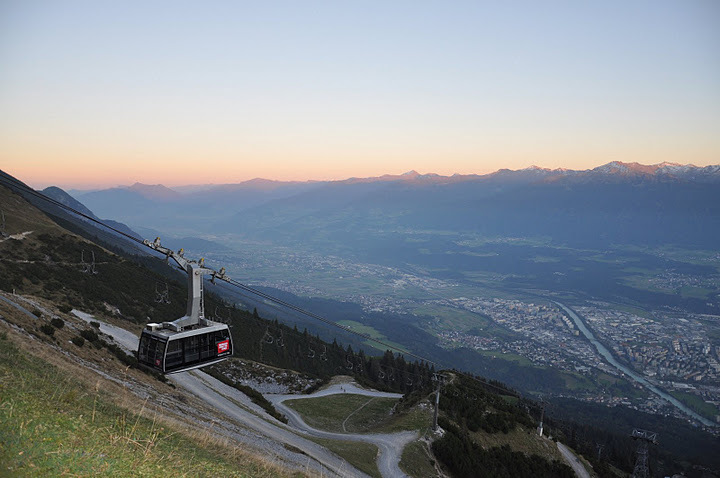 The juxtaposition of well-kept tradition and modern lifestyle create a very special atmosphere in Innsbruck. Some of the architectural and historic features of the city include St. James’s Cathedral, the Imperial Castle and Imperial Church with the cenotaph of the Roman Emperor Maximilian I, which date back to the early 15th Century, as well as numerous parks and gardens. 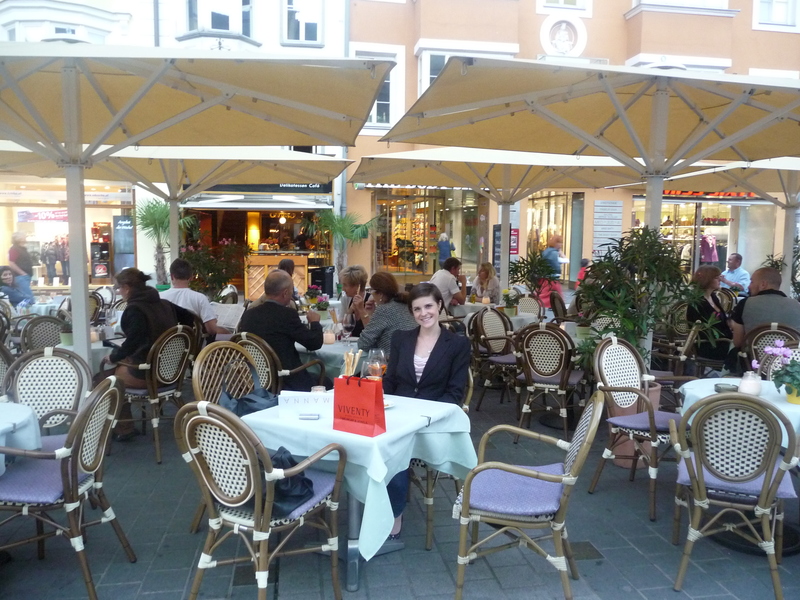 A cornucopia of restaurants, cafes and shops scattered along the narrow cobble streets of the beautiful “Altstadt” (old town) allowed for a rest from both intellectual and cultural stimuli and ensured that I never got bored on my three-day Innsbruck adventure. Me in front of the river Inn with views of the Cathedral in the background. 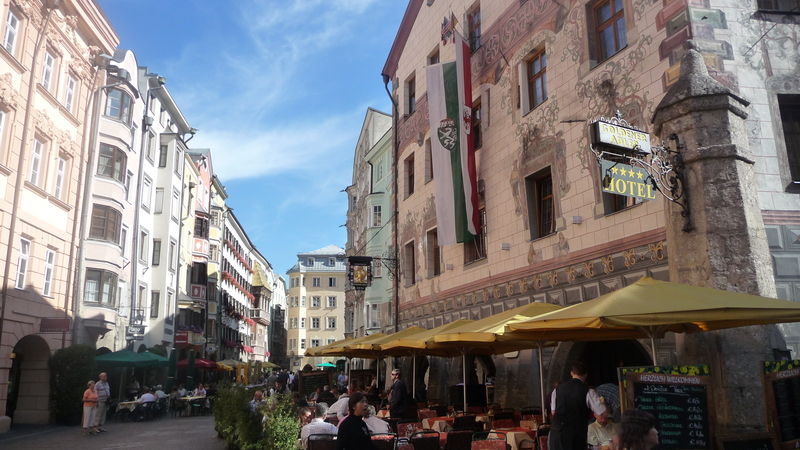 Innsbruck’s charming town centre – the “Altstadt” (old town). Taking a rest from the strains of intellectual, cultural and retail overload and indulging in some of the culinary delicacies Innsbruck had to offer. A last highlight occurred on Saturday afternoon with a final debate between Jeffrey Alexander, Stephan Lessenich and Richard Münch about one of Alexanders’ most recent publications The Performance of Politics – Obama’s Victory and the Democratic Struggle for Power (2010, Oxford University Press). Alexander gave a taste of his book by reading from an early chapter. In his book Alexander draws on vivid examples from the 2008 US presidential campaign to argue that images, emotion, and performance are the central features of the battle for power rather than policies and current affairs or even money and organizational success. Alexander evoked that the functioning of democracy is not simply ensured by supplying truth claims and rational justifications in public debate, as Habermas seemed to indicate. He described the public sphere as a stage for performance. In the struggle for power politicians have to “work the binaries” (political action must be practical and down-to-earth and adhere to simplified moral binaries) and “walk the boundaries” (manoeuvre between civil and non-civil spheres such as family, religion, sexuality, etc. in constructing and performing their public identity). Jeffrey Alexander in the closing debate of the conference. Following Alexander’s presentation, Professor Stephan Lessenich (Deputy Chairman of the German Sociological Association and Dean of the Faculty of Social and Behavioural Sciences at the Friedrich-Schiller-University Jena) and Professor Richard Münch (Professor of Sociology at the University of Bamberg) had the chance to respond to Alexander’s claims. Both took a critical approach, accusing Alexander of constructing an idealistic notion of the civil sphere and disavowing modern democracy. Lessenich was particularly adamant that Alexander’s observations are particular to the United States and could not be transferred to other Western democracies. Münch attacked Alexander’s method, suggesting that he conflates reflection with empirical description and overemphases the cultural dimension of analysing politics. As always in these types of discussions a shortage of time meant that Alexander was only able to respond briefly to defend himself. He countered that he does not see himself as an idealist but rather as a realist and that his study was precisely one of the US political climate without ever claiming to be transferrable to other democracies. To close he remarked that there is too much emphasis on social power in political sociology and not enough acknowledgement of an autonomous civil sphere. Democratic organisation should enable the independence of social power and civil society so that the former can be translated into the latter. With this lively debate the conference came to a close and left a satisfied look on the faces of all participants. The jam-packed three-day program was a complete success and will remain in my memory as particularly stimulating, collegial and entertaining. 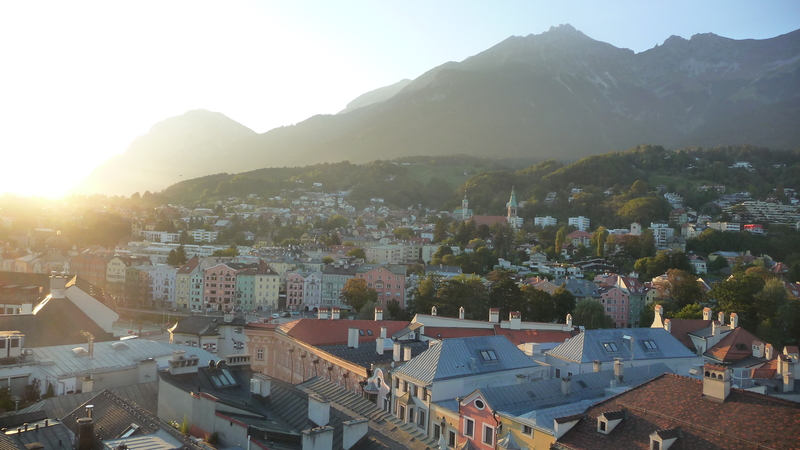 View over Innsbruck at sunset from the city tower.